What a glorious morning! It's been raining non-stop, creating the perfect mood for epic world building! But it's time I take a break and let you amazing people know what we've been up to. Apocalypse Cow has not one, not four but three absolutely distinct worlds to explore and uncover their stories. 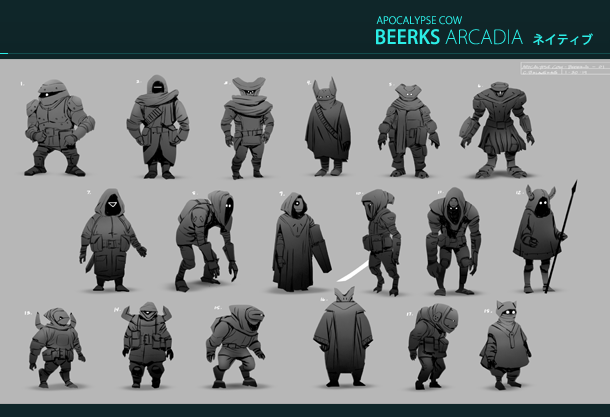 Our main focus these past few months has been the world known as Arcadia. I don't want to spoil anything so I'll just say that every world is a rich continent split into many areas with deep lore. 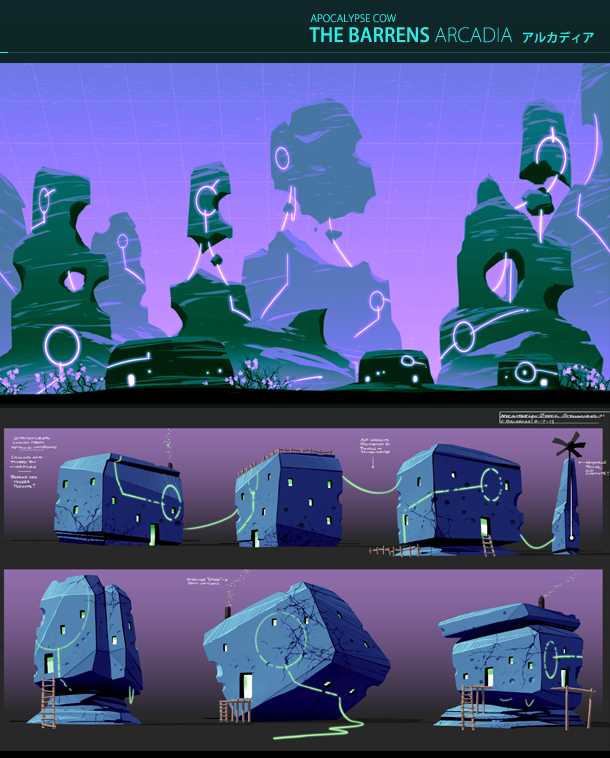 These are a couple of the concepts for an area in Arcadia called The Barrens. In tandem with each area we also work on its inhabitants. Through the course of this adventure you'll come across many different characters - some will help you, others will try to stop you. The Barrens specifically are inhabited by a race called Beerks. It's what we call a Digi-Primitive race. These were some of our initial concepts for them. We saw potential with #4 (he kind-of resembles Star Wars, doesn't he?) but we kept pushing the digital aspect of his design, eventually creating a being with his own, unique identity. At the end of this post you can see the actual in-game render in his hostile version. The universe we've been dreaming is slowly coming to life and the feeling is hard to describe. The night was brighter than usual. The clock struck midnight and the crowd erupted. Amidst the celebrations for this glorious new year, a pale creature known as game developer stood apart. Hand on his keyboard, he whispered: "I swear to write more blog posts this year!". So here I am, with the first update of 2019!! Uhm… amusing. So? What's up? We recently hit a very important milestone. The story is 100% done!!! I don't want to give out any spoilers but it is an epic storyline that plays out through several years! (drools). In the process of creating the story we wrote lore going back millennia (which we might release as a short story or comic before launch), we designed many new characters and even created a written and spoken language, complete with phonology and grammar rules! I went a little insane there but I did it on my free time, I promise. Wow, you nerded out hard. So, what are you up to now? These days Alex is trying out ideas for the various new weapons, boss fights and abilities that we're adding to the game. Elias is working on optimizing performance and I am writing the script/dialogues for our voice actors. We're also bringing in a great concept artist to enrich the worlds with the lore, for that sweet environmental storytelling. Cool! But can you show me something? Anything!?! Well… here is a random image with some of our weapons! Most of them are references, can you spot them? Thanks for your continued support, you have the best taste in games!!! Until next time!! !